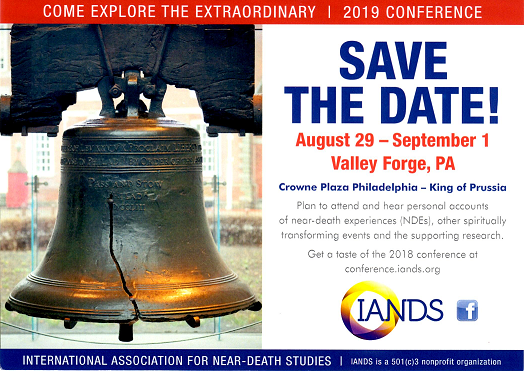 JOURNAL OF NEAR-DEATH STUDIES (ISSN: 0891-4494; formerly Anabiosis: The Journal for Near-Death Studies) is sponsored by the International Association for Near-Death Studies (IANDS). The Journal publishes articles on near-death experiences, on the empirical effects and theoretical implications of such events, and on such related phenomena as out-of-body experiences, deathbed visions, after-death communication, the experiences of dying persons, comparable experiences occurring under other circumstances, and the implications of such phenomena for an understanding of human consciousness and its relation to life and death processes. The Journal Editor(s) and Consulting Editors are committed to an unbiased exploration of these issues and specifically welcome a variety of theoretical perspective and interpretations that are grounded in empirical observation or research. PUBLICATION: The Journal of Near-Death Studies (JNDS) is published quarterly in the Fall, Winter, Spring, and Summer by IANDS, 2741 Campus Walk Avenue, Building 500, Durham, NC 27705-8878 and is printed at Thomson-Shore, Inc., 7300 W. Joy Road, Dexter, MI 48310. PEER REVIEW: Each article manuscript undergoes masked review by at least two scholarly reviewers from among the Consulting Editors or others with scholarly expertise regarding the topic of the manuscript. INDEXED in Family & Society Studies Worldwide, Health Instrument File, International Bibliography of Periodical Literature, Parapsychology Abstracts International, Psychological Abstracts, PsycINFO Database, Sage Family Abstracts, Social Work Research and Abstracts, and Sociological Abstracts. DOIs: Each JNDS publication--article, editorial, media review, and letter to the editor--is issued a digital object identifier (DOI). During a 3-year embargo from date of issue, the publication may be purchased from the IANDS office. After the embargo, the full text of the publication becomes available at no cost on the Internet. During the embargo, an author may upload an IANDS-issued pdf of the full text to an academic website such as ResearchGate.net or academia.edu. Authors wishing to upload to other Internet sites may submit a request to the JNDS editor who will consider requests on a case-by-case basis. Please note that JNDS DOIs end in a period, for example: doi:10.17514/JNDS-1997-15-4-p259-278.